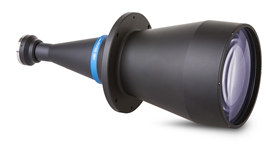 This telecentric lens has been carefully re-designed to outperform the previous generation. It features unmatched resolution, low distortion, easy phase adjustment, and homogeneous image quality while offering the best performance to price ratio. This lens is compatible with cameras having up to a 1" (16 mm diagonal) sensor. The lens is telecentric on both ends, hence the term “bi-telecentric”. With lenses only telecentric in object space, a small dot of light grows larger and becomes elliptical as it moves from the image sensor’s center towards its edge. This bi-telecentric lens keeps the principal rays parallel not only when entering but also when exiting the lens. The result is greater image precision. The working distance (measured between the front of the lens and your object) should be kept within +/- 3% of the nominal value shown below for maximum resolution and minimum distortion. The f-number shown below is the “working” or “real” f-number of the lens when used as a macro. Please contact us if you need a lens having a smaller aperture. For the sharpest image, keep the object within half the specified depth of field. The length is measured from the lens's front to its flange.